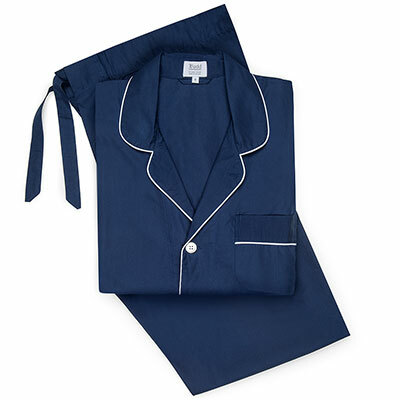 This royal blue and red Madder silk dressing gown is perfect for the connoisseur. This royal blue and red Madder silk dressing gown is for the connoisseur. “Madder” refers to the Indian plant whose root produces the dye used in the process of creating Madder silk. The complex and lengthy dying process is what gives Madder silk its unique look – colours and paisley swirls meld seamlessly and subtly - think of the depth and patina of an old master painting as opposed to the crisp, bright reality of a photograph. The gown is generously cut so you will always feel comfortable and never restricted. It has an especially generous wrap, ensuring it doesn’t flap open unexpectedly (or embarrassingly!). It is the perfect dressing gown to travel with as it falls back into shape almost immediately it is unpacked. It is a piece of luxury every man should own. Sizes come in M, L, and XL. They fit according to chest size.